United Launch Alliance’s (ULA) next-generation rocket — the Vulcan Centaur — is making strong progress in development and is on track for its initial flight in mid-2020. Image is courtesy of ULA. The Vulcan Centaur rocket design leverages the proven success of the Delta IV and Atlas V launch vehicles while introducing advanced technologies and innovative features.The new rocket design is nearing completion, and the booster preliminary design and critical design reviews have been completed. Vulcan Centaur will have a maximum liftoff thrust of 3.8 million pounds and carry 56,000 pounds to low Earth orbit, 33,000 pounds to a geo-transfer orbit and 16,000 pounds to geostationary orbit with greater capability than any currently available single-core launch vehicle. 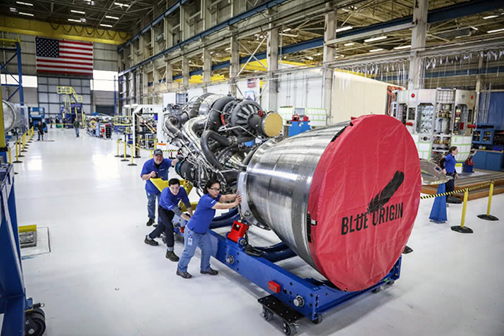 Following completion of a competitive procurement, ULA has selected Blue Origin’s BE-4 engine for Vulcan Centaur’s booster stage. Blue Origin's BE-4 rocket engine. Photo is courtesy of Blue Origin. The liquefied natural gas (LNG) fueled booster will be powered by a pair of BE-4 engines, each producing 550,000 pounds of sea level thrust. As previously announced, ULA has selected Aerojet Rocketdyne’s RL10 engine for the Centaur upper stage, Northrop Grumman solid rocket boosters, Lâ€‘3 Avionics Systems avionics, and RUAG’s payload fairings and composite structures for the new Vulcan Centaur rocket system. Vulcan Centaur will bolster U.S. manufacturing by adding to the more than 22,000 direct and indirect American jobs in 46 states supported by ULA programs. The Vulcan Centaur will surpass current rocket capabilities and launch services at significantly lower costs, while still meeting the requirements of ULA’s cooperative research and development agreement with the U.S. Air Force to certify the Vulcan Centaur for national security space missions. Tory Bruno, ULA’s President and CEO, said that the Vulcan Centaur will revolutionize spaceflight and provide affordable, reliable access to space for our current and future customers. The company is well on its way to the introduction of Vulcan Centaur — the future of U.S. rocket manufacturing. With state-of-the-art engineering and manufacturing techniques, this rocket is designed specifically for low recurring cost. Strong partners are critical to the cutting-edge innovation that is leading us into the next generation in space and ensuring mission success. Bruno noted that partnerships with Blue Origin, Aerojet Rocketdyne, Northrop Grumman, L-3 Avionics Systems and RUAG will allow the Vulcan Centaur to transform the future of space launch for the government and commercial markets, making launch more affordable, accessible and commercially available. Bruno then added that ULA has selected the best systems available to create the Vulcan Centaur. These engines and components will ensure ULA continues to lead the way in space exploration, maintain our record of success and remain America’s launch vehicle for our nation’s most vital missions. The company's new rocket will be superior in reliability, cost and capability — one system for all missions. 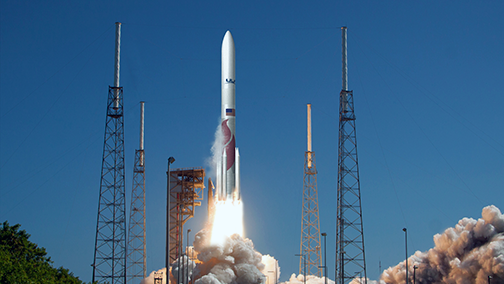 ULA has been working closely with the U.S. Air Force and the company's certification plan is in place. Blue Origin CEO Bob Smith stated that the firm is glad to have the BE-4 engine selected by United Launch Alliance. United Launch Alliance is the premier launch service provider for national security missions and Blue Origin is thrilled to be part of their team and that mission to power the Vulcan rocket’s first stage.